The Mac operating system, OS X, offers two main kinds of accounts: administrator and standard. The first account you create when you set up a Mac is an administrator account and only an administrator can affect the system or other users. It is therefore good practice to give all users standard accounts and to have a single administrator account reserved for installing software and other maintenance tasks. 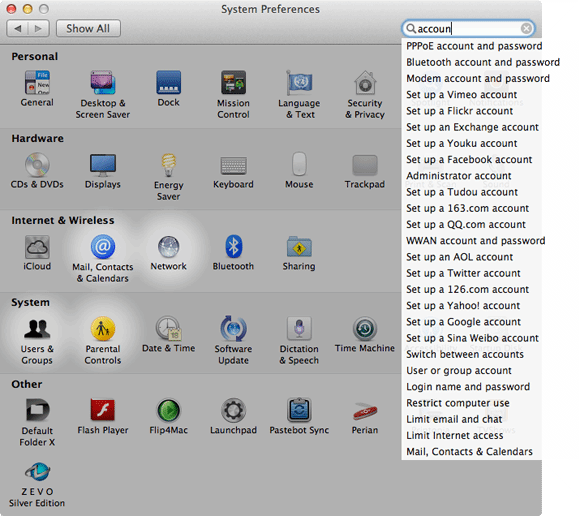 Account management is accomplished using the System Preferences application, available from the Apple menu in the top-left of the screen. Select Users & Groups from the row of system preference panes, or type "account" into the search bar at the top of the application, and OS X will highlight relevant panes. Click + to create a new account, or click on an existing account and then check or uncheck Allow user to administer this computer to give the account the appropriate privileges.